The Little Match Girl and Tiny Tim- two victims of Victorian austerity. How many children are reliant on cap wringing charity this Christmas? 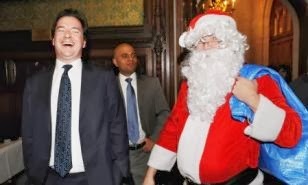 Those of us who are lucky to be able to afford a decent Christmas, hopefully, will give thought towards those impoverished by the present, nasty system, because George Osborne, David Cameron, Boris Johnston, Ian Duncan Smith, Nick Clegg et al shall have perfectly selfish millionaire Christmases in warmth and with full, fat bellies. As they swirl their brandies tonight, they will reflect on how they have broken up and sold off England's NHS and welfare system and they will be counting the dividends from these along with those made from the Post Office sell-off. For nearly 50 years our welfare system helped those of us who needed it now and again. In just a few months this year, the Tories and Libdems have dragged us down where the US is- foodbanks and people in so much debt they will never really be contributing members of the community. Our taxes instead of directly helping people go to boost G4s and SERCO profits, who deny people dignity and rights and ensure profitable health services take priority. Shame on the Tories and their Libdem facilitators. Let 2014 be the year these Tory robbers are jailed.